I’ve gone to this event almost every year, even had a stall there once (that’s a story for another time) and there never ceases to be something new to gawk at. Trust me. I got my stable food, curry fish balls, and try some new stuff. We walked through the entire night market before honing in on exactly what we wanted to try. My friend saw Chatime, crazy popular bubble tea store(s), had milk tea freezes (in traditional or durian flavours) and she flocked there. The NSSSO and I wandered over to… the ice cream burrito stall. 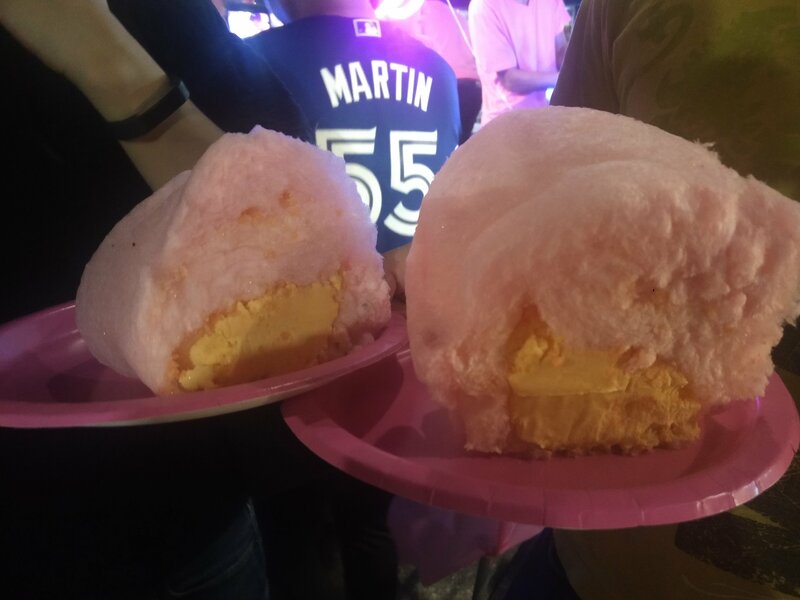 This dessert is ice cream, with your choice of toppings, wrapped in a fluffy layer of cotton candy. Holy Cow I’m in love! YOSH! is the mastermind behind this. Formerly Sumeshi, they seem to be determined to bring new and ex citing food to us here in Toronto. Sumershi was, in case you were wondering, torched sushi and now they’ve brought us these delicious burritos. For $12. Which, some people think is highway robbery (gasp, how dare they take advantage of an event to sell weird and delicious food at a high price), and other people think that they time and energy may be worth it. 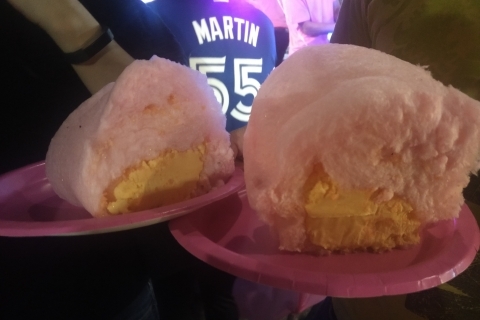 So, cotton candy and ice cream (plus toppings), sounds like a sugary disaster. I can tell you that it was probably some of the most fun foods I’ve had in a while. The balance between ice cream and cotton candy was perfect. I don’t know if they made the ice cream with less sugar or maybe it was the flavour I chose, but it was pretty good together. Not to mention, the NSSSO picked out pop rocks as our one topping. Yes, it did get caught in the cotton candy. Yes, I haven’t actually had pop rocks in yeeears. No, it wasn’t a disappointment at all. Pop rocks have their own personality (let’s say) and regardless of what you pair it with, it always takes on a life of its own. Would I have this again? Yes. Would I brave the night market for it again? Yes. Am I there right now? No, the NSSSO said we’re not going two days in a row… sad. Guess I’ll have to look for whatever Yosh! creates next.